Welcome to the official website of Nature Coast Landings RV Resort, located on Florida’s Nature Coast, in Crystal River, Florida! When you think of Nature Coast Landings RV Resort, you should think about sunshine, nature, and a variety of entertainment that is just a short drive away. Located on the Florida West Coast about an hour and a half north of Tampa, we enjoy weather that is sunny and comfortable. Biking, Hiking, Canoeing, Kayaking, Bird Watching & Horseback Riding, as well as Fishing & Boating are all in our own backyard. If you like the outdoors, you will love this park! Internet is provided to each site through high speed, Fiber Optic Service (FIOS). The resort also offers a screen enclosed pool which is heated in the winter and two club houses with many activities. The activities include pot luck dinners and ice cream socials. Movie nights, cards, and many other activities to keep you busy. Planned activities for the season, and a full social calendar are enjoyed by many of the residents. Fitness and health is a high priority in our park with our own fitness rooms and exercise classes. The park is also pet friendly. Nature Coast Landings RV Park is a gated cooperative community situated near the Gulf of Mexico. All Lots in our park are Privately Owned. The park is 200 yards from a State operated boat ramp on a canal that runs 5 miles to the Gulf. Along this canal is a paved bike/walking trail with restrooms and covered seating gazebos. In 2017 our park was awarded the Florida Rural Water Association (FRWA) for Small Public Water System of the year and Small Wastewater System of the year. These awards are something to be very proud of. The small category is for systems up to 3000 users. 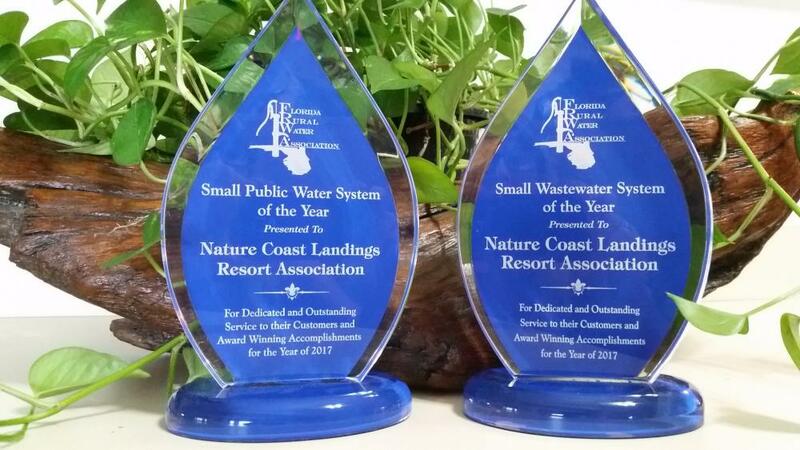 NCL was the only recipient in the state of Florida to receive two awards.